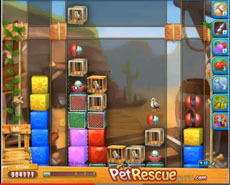 The victorious strategy in pet rescue level 312 is simple but not easy. Use the line blasters and the half blasters to destroy the wooden cages that prevent pets’ rescuing. You have to drive them in the same line and then use the line blaster. Watch out not to have another line blaster in the oppossite site of the screen, because you’ll lose it, without any benefit for you. When the half blasters appear in the screen, you have to count your moves, in order to use them as effectively as you can in destroying the cages. Don’t give up if stuck on Pet Rescue Level 312! You’d rather watch this!